As i mentioned to my last blog, i love roses , tulips and i love all the flower (kahit bulaklak ng kamote). I learned also to love orchids, though its quite expensive. And my husband first love flowers is Orchids so what can i do?!! but to take care about his princess in the POT. 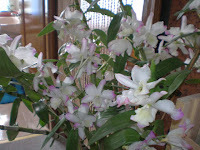 ( orchids is one of my hubby collections)... hehe I remember my lola when i stay with her, she has much flower and plants around from wild plants , medicinal, vegetables, etc. Name it she have it. That's why her house is look like a secret garden or we can say a secret kubo inside the garden because her house is smaller than the garden she had. At that time i was never pay attention what the beauty of nature is. And how my lola took good care the plants to brings flowers, and for us to pick them and play them all.